Tarthang Tulku is one of the last remaining lamas to have received a complete education in pre-1959 Tibet. After teaching at Sanskrit University in India and founding Dharmamudranalaya (Dharma Publishing) in India, he settled in Berkeley, California in l969. He founded the Tibetan Nyingmapa Meditation Center, the Tibetan Nyingma Relief Foundation, Dharma Publishing (USA) and the Nyingma Institute within the first four years of his arrival. In 2009, he founded the Guna Foundation to share these accomplishments and the wisdom tradition of Tibet with the world. Biography: Tarthang Rinpoche, commonly known as Tarthang Tulku. Rinpoche was born in in the mountains of Golok in the far northeast of Tibet as the son of Sogpo Tulku, Pema Gawey Dorje (b 1894), a highly respected physician and holder of the Nyingma Vidyadhara lineage. Before Rinpoche was two years old, he was recognized and given the name Kunga Gellek by the Sutrayana and Mantrayana master Tragyelung Tsultrim Dargye (b. 1866), who made predictions about Rinpoche’s future mission as a servant of the Dharma, and instructed his parents in the special treatment of young tulkus. Rinpoche’s training began at a very early age, and his first teachers were his father and private tutors. After the age of nine, he resided at Tarthang Monastery where he was initiated into the teachings of the Palyul tradition by Tarthang Choktrul and given instruction in Mahayana view, meditation, and conduct by various expert khenpos. At the age of fifteen in the iron tiger year of 1950, Rinpoche departed from Tarthang Monastery to travel to the major monasteries of Kham in eastern Tibet. There he received blessings, teachings, and initiations from the greatest masters of the 20th century: Jamyang Khyentse Chokyi Lodro, Zhechen Kongtrul, Adzom Gyelsey, Bodpa Tulku, and others, altogether thirty-one teachers. For the next ten years, until the age of 24, Rinpoche was given intensive training in the three Inner Yogas of Maha, Anu, and Ati. In 1958 Rinpoche departed from his homeland, traveling through Bhutan into Sikkim following in the footsteps of his root guru, Khyentse Chokyi Lodro. The next several years were devoted to pilgrimage and retreat at holy places in India. In 1963 he was appointed by Dudjom Rinpoche as the representative of the Nyingma tradition and given the position of research fellow at Sanskrit University in Benares. In that same year, he set up one of the first Tibetan printing presses in exile and began his life’s work of preserving sacred art and texts. After six years at Sanskrit University and some twenty publications, Rinpoche decided that this was not enough, and departed for America to bring Dharma to the West. Arriving in America in late 1968, Rinpoche chose California as his headquarters, and established the Tibetan Nyingma Meditation Center in early 1969. One of the first learned Tibetan exiles to take up residence in the West; he has lived continuously in America for over forty years. 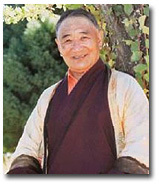 With the full support and blessings of Dudjom Rinpoche and Dilgo Khyentse Rinpoche, Tarthang Tulku began in the 1970s to unfold a vision of wisdom in action that would eventually encompass over twenty different organizations and make a significant impact on the transmission of Dharma to the West and restoration of Dharma in Asia. Thanrthan Rinpoche has too many books under his name. The few most popular ones are only mentioned here and easily available through the Web.